Moveable planters in the center of the room with green plants -just like in a fancy restaurant. 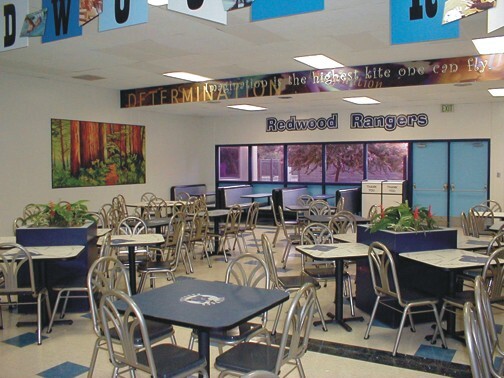 The colorful Redwood Rangers name on a large ceiling hung art piece with academic and sports pictures included. 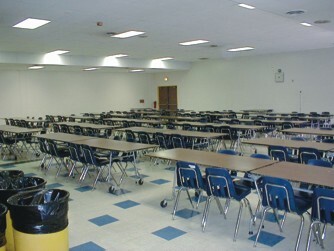 Before: Not a bad cafeteria - clean and neat with long rows of dark walnut tabletops and blue chairs. But not real exciting to attract students into the room. After: Now the room has banner artwork highlighting the school Ranger logo with academic themes, and a huge, beautiful 5 feet high by 10 feet wide hand-painted mural of a huge redwood tree with a hiker. The tables have school mascot logos inlaid in the tops, and the booths along the walls make the room look like a fast food restaurant.